A beautiful ladies' bracelet watch by Guess. Featuring a mother of pearl dial and glittering stone set bezel, this glamorous timepiece is completed with a stainless steel bracelet with rope inspired appearance, for a contemporary stylish approach, sure to keep you on-trend this season. 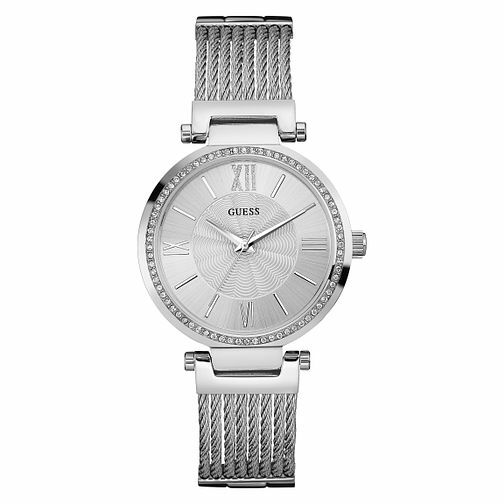 Guess Ladies' Silver Tone Rope Style Bracelet Watch is rated 5.0 out of 5 by 1. Rated 5 out of 5 by Anonymous from Purchase of watch Smooth transaction from purchase to collection. Kept well informed of the prices stage to delivery.